Departure time is at your request and can be either morning or afternoon. Once your chosen time is established you will be picked up from your hotel. 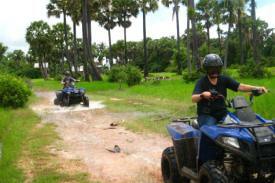 The transport will take you to our office for a brief quad bike familiarization and safety briefing. After the briefing you will be on your way on your own quad bike. The tour goes to a rarely visited temple called Prey Monti. The temple was built in the 9th century and has slowly been lost to the surrounding forest. The tour will also take a look at local life in a rural area. Enjoy beautiful scenery and see local children playing. The tour will give you a brief glimpse of the reality of living in the countryside. * 2013 POLARISE TRAIL BOSS 330cc. Plus helmet and fuel. * Safety briefing and familiarization prior to ride commencement. * Knowledgeable local guide leading the tour group. * Cold pure drinking water. * Hotel Pick up and Drop off. Minimum age for a solo rider is 12 years old. 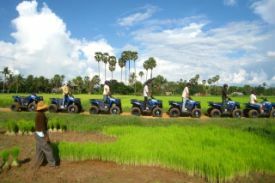 Complimentary hotel pick up and transfer to our office for a safety briefing and Quad bike familiarization prior to leaving on the ride. 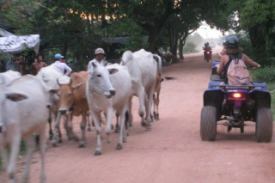 Once the briefing is complete the tour will head off to explore the rural countryside of Siem Reap. 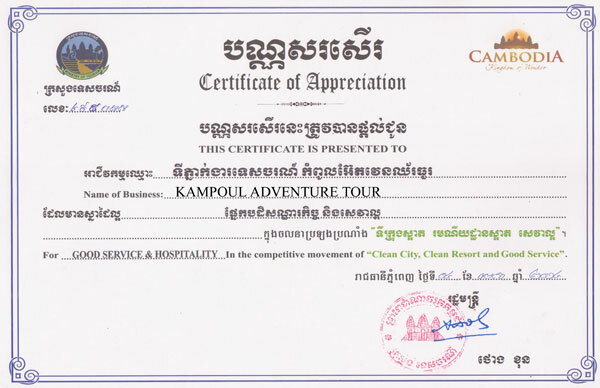 This is a great tour to see a different aspect of Cambodia, after enjoying the many beautiful temples of Cambodia. 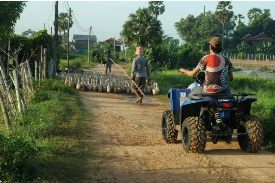 This tour will expose you to the authentic rural life of Cambodians and the beauty of the Siem Reap countryside. You will get to share experiences with the local villagers in the remote villages you ride through. Unlock the traditional feeling of the Khmer people in a cozy rural house in the countryside. 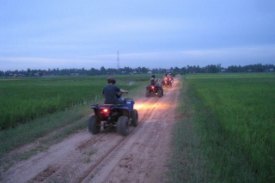 Take in the stunning scenery of the countryside and rice fields along the way. 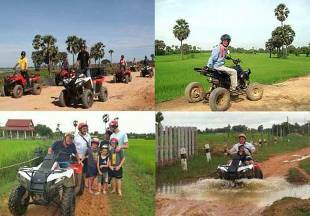 This is a great tour to have fun and escape the crowds while discovering the hidden history, culture and traditional lifestyle in the rural countryside. You will arrive back to our office at 4:30pm and transferred back to your hotel.